The Bolivar Petit Coronas is one of Bolivar’s best seller, a strong and creamy Mareva, 5.1” (129mm) long, of 42 ring gauge, and comes in 50 cigars cabinet. Along with the Belicosos Finos and the Royal Corona, this is one of our favorite cigar. This is a cigar that makes itself known right from the start. A Pre 1960 release. • The thin ring gauge means this is a very direct and rapid burn and its responsiveness does not falter as it burns. • A rich and exotic blend like this needs some age to be at its best. Tight dense construction, perfect burn that goes on for the entire length. Rich creamy leathery smoke for the first third then on comes the change in a deep musky satisfying smoke. 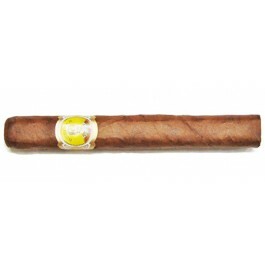 The Bolivar Petit Corona is a very well constructed, very firm and well packed cigar. An attractive golden brown smooth wrapper, with little veins. Semi-box pressed with a nice cap. Like most Bolivars, there is a strong scent of wood, as well as cocoa with a muskiness on the wrapper. The cigar lights up very easy. The draw is on the firm side, as expected from the beginning, but it's not at all unpleasant. Any uneven burn quickly evens out, while thick grey ash is forming and stays perfectly on the cigar. Yields billowing clouds of rich smoke. It is medium bodied in the beginning, with a strong taste of earth and wood, with some hints of spice. The cigar turns into full bodied, with lots of spice. The draw is slightly looser, but still firm. The flavors are more complex, with the earthy flavor being more intense. The tones of vanilla, cocoa and coffee appear. The creaminess begins. All very well balanced with spice, wood, cocoa and fruits, delivers full and robust creamy flavors. If smoked slowly the cigar smokes well until the end, without becoming hot or overwhelming. A lot of aging potential. Smoke this vitola slowly. In summary, as a classic Bolivar, the aftertaste is long and extremely pleasant cedary sweet wood with hints of cardamom.